What a weekend for wind…and if you were anywhere on the Kohala coast this past weekend, we know you’ll agree that those trade winds just didn’t let up. Unfortunately those strong winds cause us to travel much, much more slowly when at sea…so we can’t cover as much ground during our Whale Watch Cruises. On Friday’s Wake up with the Whales Cruise we took advantage of every minute we could, even staying out 20 minutes longer than scheduled to see if we could find Humpbacks. 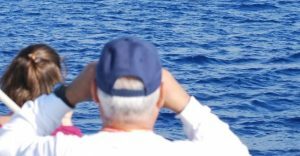 We saw lots of flying fish, and two Manta Rays…but no whales…so we called the trip a “Fluke” and invited everyone aboard to join us again on another Whale Watch Cruise for FREE! Since we had 30 guests aboard, when we got back to the bay we had to make two trips to shuttle everyone back to the beach, which took about 15 minutes. Just as that last guest stepped off the shuttle, we looked out to sea and saw a spout just outside the bay! We operated cruises on Saturday and Sunday, and those trips were “Fluked” too. We feel bad we couldn’t find whales, and the only thing that makes us feel better is that we know that our guests will all be able to join us again and again until we do see Humpbacks! The Ocean Sports Guarantee is a real one…we don’t limit our guests to just one extra complimentary cruise! P.S. Look for my next report in the middle of the week! Ocean Sports Whale Fact of the Day: Though most of us on Whale Watch Cruises in Hawaii are here to see the Humpback Whales, according to our friends at Cascadia Research Collective there are actually 18 species of Odontocetes (toothed whales) and 7 species of Mysticetes (whales with baleen) that have been documented in Hawaiian waters.